Kentucky is home of Bourbon. I am not much of a drinker, and honestly had never heard of Bourbon till I moved to KY.
As you drive along the outskirts of Lexington you see big signs for several Bourbon distilleries, giving directions for the Bourbon tour. I started researching what other things were made with Bourbon, and found that there are several candies that give you a hint of bourbon without having to indulge completely in the high octane drink! I looked on Etsy for Chocolate Bourbon Balls and found Debi McQueen from Berea KY and her shop Sweets and Treats. She sells lots of homemade goodies on her site, but the bourbon balls were the ones that caught my eye. I think bourbon actually has a buttery, smooth flavor to it and thought that and chocolate would be a fantastic combination. We finally got a break in the weather here in KY and Debi graciously sent me 10 of her milk chocolate bourbon balls to try out. They arrived packaged in good condition for having been shipped in still fairly warm weather. I opened the tupperware container and could smell the bourbon scented candy immediately.. so yummy! I had never tried bourbon balls before, and after just one bite of Debbie's I am hooked. These melt in your mouth!! Fantastic rich chocolate on the outside, a creamy vanilla inside with pecans soaked in bourbon for days. The combination is like nothing I have ever tasted before. These are made with Maker's Mark bourbon. I need to find how far of a drive Sweets and Treats is from my house so I can get my bourbon ball fix once these are gone. I haven't shared with anyone. My daughter took one bite and said she didn't like it. I told her GOOD, they are Mommy's!! The men can have their KY bourbon, and I will take these KY bourbon balls!! Thanks so much to Debi at Sweets and Treats for introducing me to these wonderful treat. Your package will come wrapped in bubble wrap and given great detail to keeping your candy safe. She also makes Buckeye Balls (Ohio specialty! ), Mounds Balls, and other chocolate dipped treats. So if you aren't from these parts and don't want to try bourbon, she can still take care of your sweet tooth!! Fantastic candies for your holiday tray, and as gifts to co-workers! Wow! Those Bourbon Balls look amazing and from what I've read in your review, they taste amazing too. 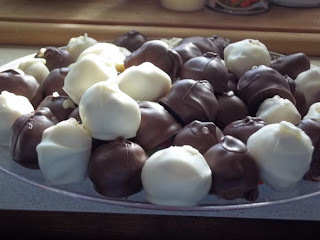 I love chocolate covered treats so I'm off to check out Debi's Etsy shop :) Thanks! Oh yum! I'm a bourbon and whiskey girl...and being a girl...I also love chocolate! These sound delicious! These sound yummy and what a great combo of flavors. I heart chocolate! These sound yummy- especially since they are made with Maker's Mark! I would love to try her Buckeye's, too. I'm not a drinker of bourbon either, but these I think I would try! I love that you have a Kentucky theme going on here! I could not be more proud of my home state. My mom makes bourbon balls every year for Christmas. These remind me of home! they look and sound wonderful! her oreo balls look yummy too! Those wouldn't last a minute in my house. My mouth is watering just thinking about all those flavors...and being soaked in bourbon for days...Yum! Oh my! Now I really need one lol! These look amazing and she is certainly talented! OMG nom nom nom!!!!!! Nice detailed post! Sounds yummy. I think I would enjoy the buckeyes more than the bourban balls. MMm those look so yummy! I am a major chocoholic!